Barnham Broom towermill was built by millwright George Shafto in 1818 and was worked in conjunction with the adjacent Barnham Broom watermill some 30 yards to the west. The mill ran 2 pairs of stones. The base of the tower had a diameter of 22ft 6ins. 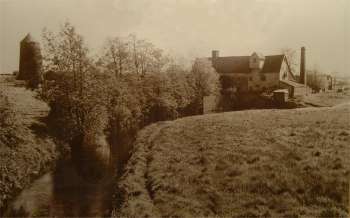 The watermill was probably also worked in conjunction with a postmill that lay a short way to the east as the Tithe Award of 1847 showed that the land surrounding the postmill was owned by Robert Atkins who also owned and ran the watermill and the land had probably been in the family for some time. 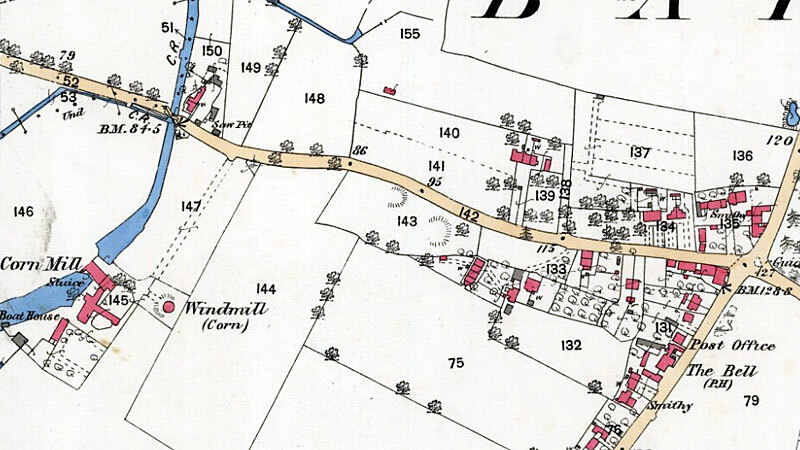 It is also likely that the postmill ceased to work some time after the towermill was built adjacent to the watermill.. The valuable FREEHOLD MILLS at Barnham Broom, Norfolk, consisting of an excellent water mill & windmill, with flour mills, machinery & going gears complete, now in full trade. Also a good substantial built Dwelling house lately titted up, with a well planted garden & 4 acres of excellent meadow land adjoining & a chaise house, granaries, stable, waggon lodge, piggeries & other suitable Buildings. The Machinery in the Mills are recently built & the Mills are capable of manufacturing at least 7 lasts of corn per week. Barnham Broom is situate in a fine corn country, 4 miles from Wymondham, 7 from Dereham & only 9 from Norwich, all good corn markets. Norfolk Chronicle - 10th, 17th & 24th October 1818. All those two powerful Water & Wind Corn Mills with a good Dwelling house, Barn, Stable & other Outbuildings & about 20 acres of superior Arable, Meadow & Pasture Land situate at Barnham Broom in the County of Norfolk now in the occupation of the Trustees of Mr. Robert Atkins. For Rent & particulars apply to S.H.L.N. Gilman, Esq. Hingham, Mr. Frank Freestone, Solr. or Mr. Butcher, Auctioneer, Norwich. 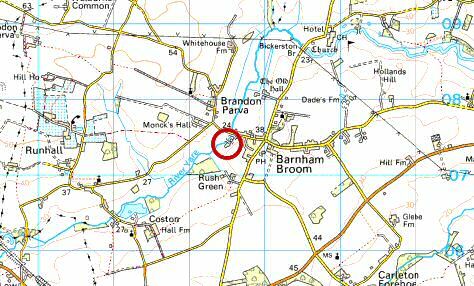 The BARNHAM BROOM WIND & WATER MILLS & 40 acres of very good land. The Wind Mill drives two pair of stones & the Water Mill three pair of stones. Apply to Mr. Roberson, Barnham Broom Mills, near Wymondham. John Standley has received instructions to Sell by Auction all the Live & Dead FARMING STOCK, Mill Carriages & Sacks … of Mr. Burton B. Harvey under a Deed of Assignment. Particulars in future papers ..
To be Let on Lease. With immediate possession. 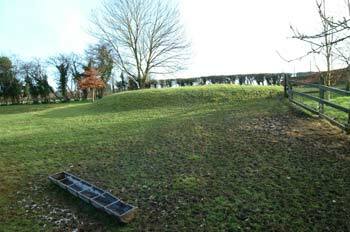 With an excellent Residence & about 42 acres of fine Arable & Pasture Land. The Water Mill drives three pairs of Stones & the Windmill two pairs. Apply to Mr. Forrester, Tombland, Norwich. The Barnham Broom Mills and small Farm adjoining. The windmill containing two pairs of stones and the Water Mill three pairs and has a Steam Engine (belonging to the tenant) attached to it. Distance from the Hardingham and Kimberley Railway Stations about 2½ miles. Norfolk Chronicle - 11th May 1867. In the MATTER of the Deed of Conveyance for the benefit of Creditors executed by David Sayer of Barnham Broom near Wymondham in the County of Norfolk, Miller & Farmer bearing the date the 11th day of March 1867 & duly registered under & in pursuance of the 192nd section of the above Act. 12 o'c at the Mills. Wanted an experienced Person who must be a Married Man. Apply to Mr. S. T. Turner, Barnham Broom, Wymondham. Sale of effects of Mr. Sippens T. Turner, who relinquishes occupation of the Mills. Severe gale. Cap of mill blown off beside much damage to trees, stacks etc. etc. 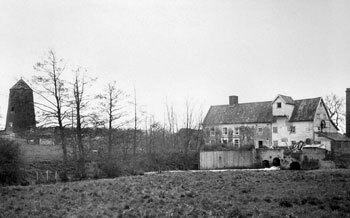 The Norfolk News of 29th March 1957, published an earlier photograph of the derelict mill that showed a three storey tower with no cap, 2 sails of 9 bays but no shutters, the windshaft and brakewheel, the fan stage but no fan. Mill House is a C18 house erected on two storeys. It has 5 bedrooms and there is a self contained annexe. Outside is an old stable block converted to provide a studio/games room and car port. The grounds include old mill workings and extend to nearly 3 acres. There is mains electricity, well water, and drainage is to a septic tank. Oil-fired central heating is installed. Apply: Messrs. Jackson, Stopps & Staff (Mr. M. Knight), 168, High Street, Newmarket. 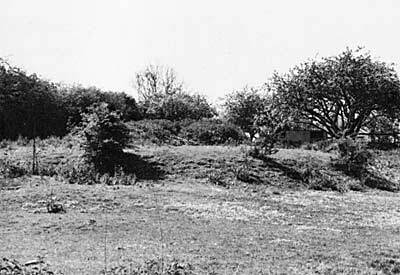 In 1984 Harry Apling reported that the only remains were the mill foundations and about 5 courses of brickwork. The youngest of the children Clarissa aged 10 in 1841 appears to be the wife of my Great Grand Uncle Edward Henry Howes. Edward Henry Howes was born on 6th February, 1839 in Wymondham and died on the 3rd September 1900 at Bondi Sydney Australia. Clarissa Cook was born in 1832 at Norfolk and married Edward Henry Howes on 25th March 1860 at St.Stephens Church Norwich. The Marriage Certificate recorded her fathers name was William Cook and he was a Miller. Unfortunately Clarissa Cook died on the 7th October, 1860 from a miscarriage aborted at 6 weeks. As both myself and other relatives have a great interest in the Cook and Howes family we wondered if anyone may have any further information which could be helpful to the families here in Australia. c.1942: Mill blown up by the army as practice and the rubble used in the construction of a local airfield.